UA 6061 tomorrow. Showing J8, PZ4 since yesterday. No ones been upgraded as of now, and we’re basically at T-23. I’m on a 3 pax PNR, with 2 silvers, so I presume soemone should have been upgraded now, if not the 3 of us. I know the system sometimes delays sweeps by a few minutes, say 5-15. But never seen it not run this long with open space. Any idea why this might happen? Do you have an instrument applied? If not, this is the new normal. There no longer appears to be any correlation between some specific PZ value and CPUs running. interesting. Ok. I know they haven’t always CPUd with old R/PZ2 or less, but seeing PZ4, I’ve never seen a sweep not occur, except way back in the very new post merger days, when out of sync PNRs basically froze the upgrade process. minutes before, but never longer than 15. Interesting find today.....have been waitlist for a GPU for 8 weeks - NRT/SFO/LAX & VV - booked B class - called the 1K desk to understand how long is UG waitlist to be told I'm at the bottom as I'm Silver - whereby i have been 1K for the last 5 years.....system bugged out or what. Wonderful agent called Donna worked with her supervisor to reinstate correct status & now at the top......anyone know why a 1K would be tagged as Silver? No. General member, upgrade request supported by my RPU. No idea. I would have inquired with the GA had I been there. From what's been reported about how the visible list populates in a few edge cases, I think it's possible that 2. Sto, R and 7. Hob, K were supported by GS certificates (and had no status) but were on lower fares than 1. Erk, J. If PN opened they could have been cleared by the computer first. Not sure what a GA would have done in that case, but I'd expect adhere to the visible list instead. In any case, I agree it looks odd. Flight in two days on e75, booked 1/12 in F, has been PZ9 for last two days at least, no CPU. It's a short flight, so I'm just going to wait and see what happens. Perhaps I need to count down to 22h45m to see what happens next for me. This weekend I flew the ERJ175 where it was PZ7 or more both directions up till departure. Outbound I upgraded at the Plat window, as normally happens. On the return the computer processed no upgrades even though inventory was 3 of 12 booked with a high PZ availability. GA processed all the upgrades at the gate as we boarded and it went out 10/12 so it really does just seem random when the computer chooses to upgrade. Just want to make sure I'm not missing something here. I had sponsored an upgrade on a domestic flight with an RPU for a non-status flyer, who was #1 on the upgrade list for the flight below since check-in opened. How did #7 jump the list and snag an upgrade after check-in has closed? I understand there's variability before it goes to the gate, but I thought by this point (i.e. check-in closed, less than 30 minutes to flight time) the list was the list. Thanks. I once had employees on stand by #3 and #4 clear before me and my partner #1 and #2 on a flight from EWR to GVA. They were the parents of one of the flight attendant. Meanwhile they got the 2 seats together when my partner and I were separated. So I guess everything is possible !! Recently I had an ORD-HKG W fare W/L for PN -- at booking it was PN0. But a few days ago I checked, and it was PN3 PZ1, but my upgrade had not cleared. I called GS, and the agent manually pushed it through. She told me that she sees a lot of these "stuck" upgrade W/Ls that don't clear when PN/PZ opens, and has reported these up the chain as she verified they are supposed to automatically clear if upgrade inventory is released. Yes, waitlisted instruments are absolutely supposed to clear when inventory opens (and sometimes don't). CPUs, though, are not guaranteed to clear at any particular PZ number. Waitlisted and Upgrade Requested on same itinerary with RPU applied to the the one way itinerary? The segment in question is the second one, not the first one. Do the details match exactly? My bet is that there's been a schedule change which has confused the display. Called 1K and they said that RPU was only applied to the 50 minute flight segment (#1) and not on #2 (DEN SFO) and they "fixed" it. Flight is tomorrow so a bit of a moot point. That said what does the second message mean? Don't RPUs clear into PZ? The RPU was on both segments, but one of them had some kind of schedule change so the record got out of sync. 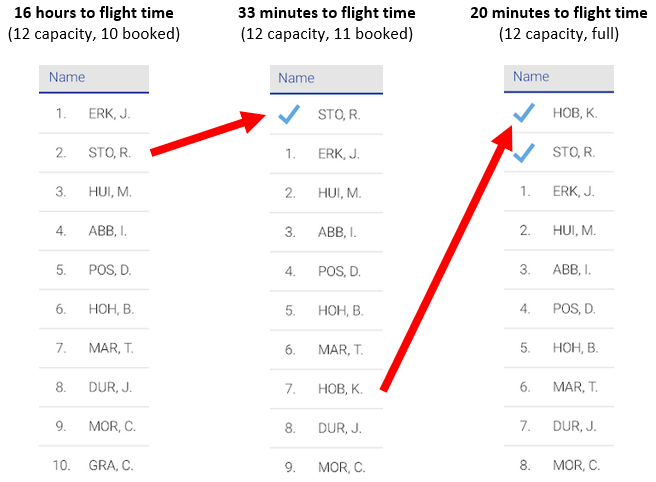 The agent "fixed" the record by correcting the flight information on the waitlisted segment. Are you flying with a silver?